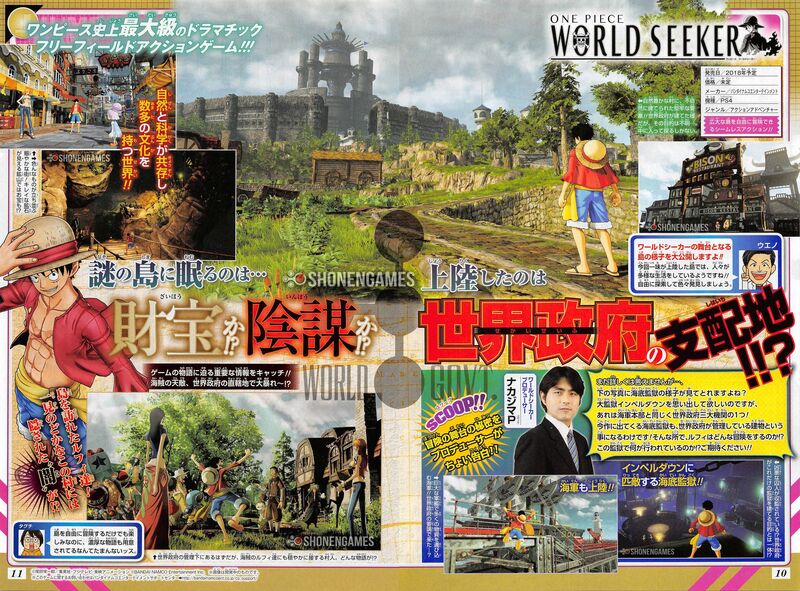 The latest issue of Weekly Jump has new information and screenshots on the island which One Piece: World Seeker is set, and also confirms the appearance of the Straw Hat Pirates. The island is described as a world of many cultures, where nature and science coexists. One screenshot shows a bustling town, and another shows a mine filled with crystals where there may be treasure. Luffy and the other Straw Hat Pirates visit the island together. It is said that there may be a hidden “darkness” on the seemingly tranquil island. Another screenshot shows villagers, expected to be under the control of the World Government, kindly welcome Luffy and company. The headline screenshot shows a village rich in nature, with a man-made, robust fortress in the background. It seems to have been built by the World Government, but its purpose is unknown. Luffy will enter and explore this area. While I can’t say anything in detail yet, can you take a look at the Underwater Prison in the screenshot below? I want you to remember Impel Down, the Great Prison, but that is one of the World Government’s big three institutions like the Marine Headquarters. That means that even the Underwater Prison that appears in this game is a building under the control of the World Government! What kind of adventure will Luffy go on here!? What is going on in this prison!? Please look forward to more!! One Piece: World Seeker is due out for PlayStation 4, Xbox One, and PC worldwide in 2018. In Japan, it will only be available for PlayStation 4.